We lost an icon of cultural history yesterday, with the passing of Abigail Van Buren, aka Dear Abby. Pauline Esther Philips started her column in 1956, and quickly became known all around for her sage advice, often embellished with a bit of humor. 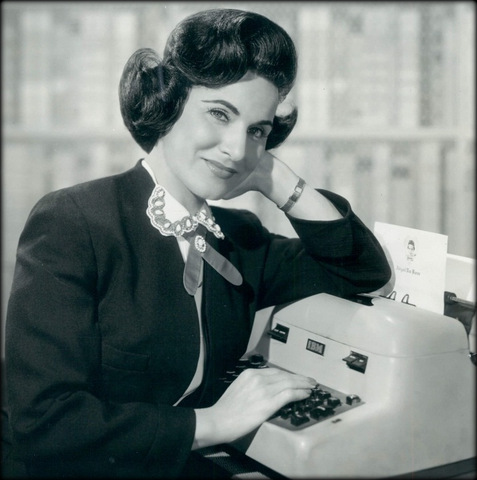 Her twin sister, Esther Pauline, aka Ann Landers, wrote a similar column. I was honored to have a letter published by Ann Landers about 15 years ago. I have a copy of it around here somewhere, and will always keep it, because it was my little 15 minutes of fame. But it was Dear Abby who I grew up reading with my breakfast cereal every day, and whose style I preferred. She grew up as "Popo," but took her pen name as her personal one, going by Abby to everyone who knew her. Esther grew up as Eppie, and never used her pen name to friends and family. Just hearing that the twins' names were Eppie and Popo makes me smile. I'm not sure of the year on this one, but I'm better late 50s. And how about that early IBM Selectric typewriter? That was some pretty fancy typing, for those days.